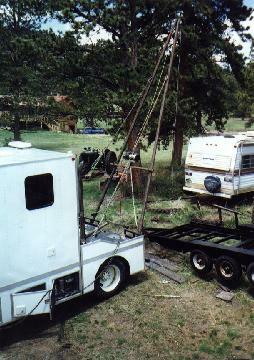 For this project, I fabricated a 24 foot boom that was mounted on the back of the motorhome. It is powered by a 12 volt 10,000 pound winch. This picture shows the testing of the boom after it was first constructed. It is lifting a trailer that I am building (no, I didn't list it on the projects page). 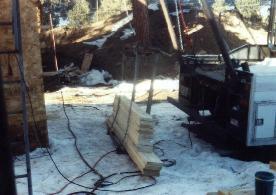 In addition to lifting the beams, I used the boom to raise the lumber for the roof. In this photo you can see the fixture I made to hold the lumber . 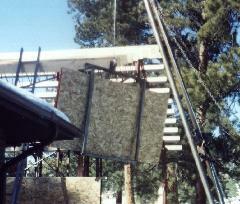 In this photo you can see the OSB sheet being raised to the roof. In the background you can also see the 2X8 purlins for the roof. I finished the roof on January 1, 2000. I guess I should say that I finished the roof for the winter. (just beat the snow that occurred that day). The OSB (75 sheets worth!!) is attached and the 30# felt is stapled on. I will install the asphalt shingles when the weather clears up this spring. As of March 19, all of the OSB is installed, the front wall built and the garage doors installed (the were installed the day that Brandon was born!! ).